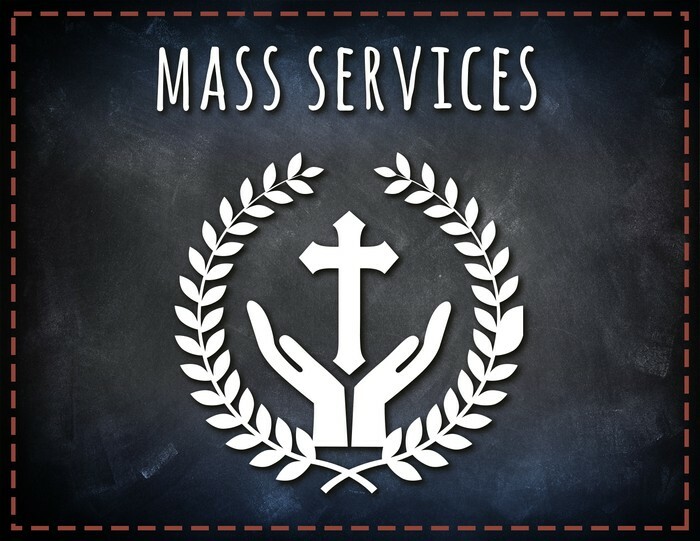 One of the wonderful celebrations at Prendiville Catholic College is the weekly community mass in the Good Shepherd Chapel held every Wednesday morning from 8.00am to 8.30am. We have two engaging chaplains, Fr Joe and Fr Truc who celebrate the mass on alternate weeks. Wednesday mass provides a time to stop, reflect and take a short time out amidst the business of our week. This mass is available to all students, families and friends of the College. Please feel welcome to come and share in this weekly celebration every Wednesday in the Good Shepherd Chapel. The second round of colours were awarded at year group assemblies this week. 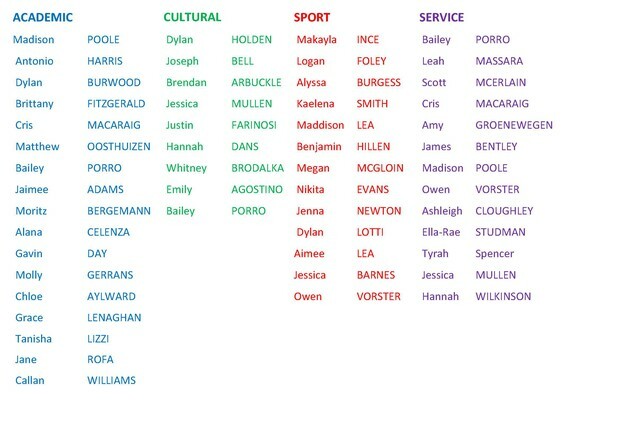 Congratulations to all students who have received colours so far. I wish everyone a wonderful Term 3. Students in Years 10, 11 and 12 will receive their meningococcal immunisation on Monday 21August upstairs in the Prendiville Centre. What is the Meningococcal ACWY Vaccination Programme? This vaccination programme is a response to a recent increase of meningococcal infection caused by a particular type of the bacteria ‘serogroup W’. Individuals aged between 15 and 19 years within WA will be targeted to receive this vaccine in order to reduce the spread of this disease. Why is the program targeting 15 to 19 year olds? This age group experiences some of the highest rates of meningococcal carriage and illness. Once infected, they can transmit the bacteria to people who are at increased risk of infection, including young children. It is expected that providing the meningococcal W (Men W) vaccine to this age group will reduce the spread of this potentially life-threatening infection within the WA community. Why is this targeted vaccination program necessary? Although numbers are low, Men W cases have been increasing each year since 2013 with one case notified in that year and 14 cases in 2016. Two more cases have been notified in 2017. Prior to 2013, serogroup W was uncommon with only six cases diagnosed in the 13-year period from 2000 to 2012. Which vaccine will be used? The meningococcal ACWY vaccine will be used. This vaccine protects against four groups of meningococcal bacteria: A, C, W and Y. The conjugate meningococcal ACWY vaccine Nimenrix®, supplied in Australia by Pfizer, will be used in this programme. To read more about meningococcal disease, click here. 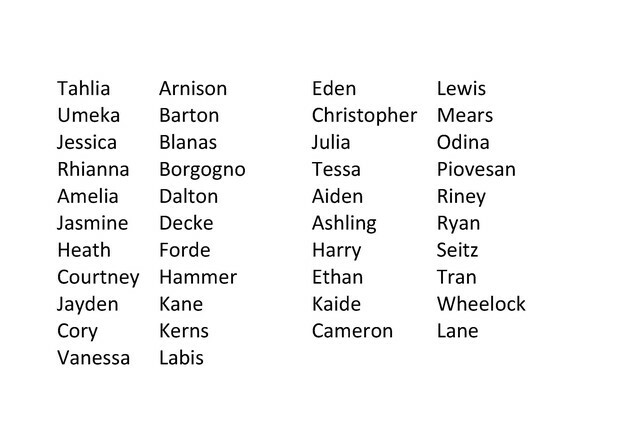 Students will be separated into the following groups based on the 1st initial of their last name. All students are reminded to wear their sports uniform for the day for comfort and ease of immunisation. Please feel free to call or email Esther Stuart the College Registered Nurse if you have any questions or concerns regarding your child’s immunisation. Over the past week Prendiville families have been hosting our visiting Japanese students. The College is extremely grateful to the host families for their assistance in running this program. Without their generous support the programme would not run. Feed back from the Japanese students has been very positive. The Japanese students have been amazed at the generosity and support they have received from their adopted families. They will all be sad to leave. 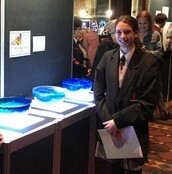 Jenna Newton won 1st Prize in the 3 – Dimensional Category at the St George's Art Awards last month. Now in its fifteenth year, the exhibition is arguably one of biggest events on the Visual Arts calendar, showcasing creative works by senior school students from across Western Australia. One hundred and twenty-eight artworks were showcased at this year’s exhibition and, with the exception the highly commended certificates (the equivalent of runner-up), there are only five major awards given out each year. 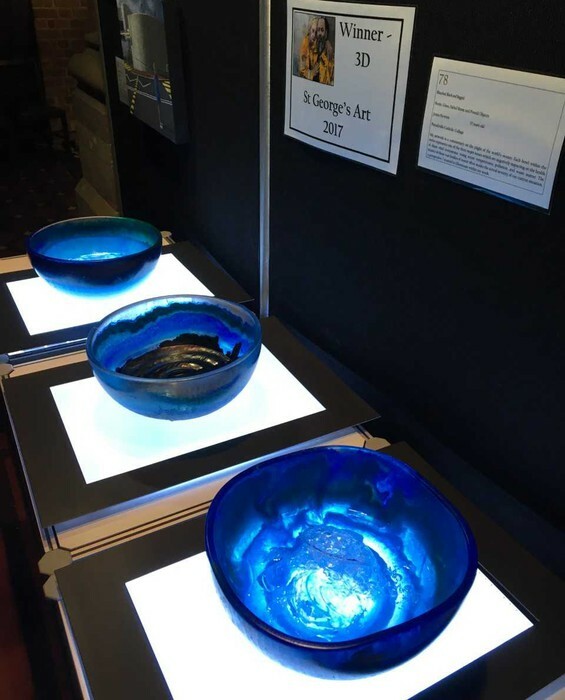 Jenna's win is significant at it makes it the third year in a row that a Prendiville Visual Art (ATAR) student has won, one of the top five awards at this event (Charlotte Bradley 2015 & Justice Goodrick 2016). The consistency of awards for artwork being created by Prendiville students is proof that, as an Arts area, we're definitely heading in the right direction. Congratulations, Jenna! 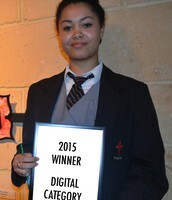 Sofia Ampil (Year 11) and Paulina Gamez - Villarreal (Year 12) also had work selected for this year's exhibition. What a fantastic Maths Week we have had this year. Commencing with the Australian Mathematics Competition where our top 30 mathematicians in each year group were invited to test themselves against the problems posed, we were extremely pleased with the positive participation of these students and wait with interest to receive certificates and awards. A very special thank you to Ms Charles for her exemplary organisation of the event. The Chocolate Treasure Hunt was solved in record time by Hayden McQueen due largely to his ability to use binary code to reveal the location of the hidden prize. Thanks here must go to Mrs Mernagh for her creative use of technology and mathematics. 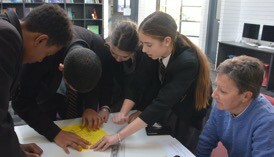 During the week, teams from across all year groups joined the A-maths-ing Race solving problems and locating clues throughout the campus in the hope of securing the prestigious MATHS WEEK HOUSE TROPHY. This activity was a lot of fun and highlighted for many students the importance of estimation in mathematics, collaboration to solve problems and ultimately the importance of reading instructions! Our showcase event this year was THINK 2 INFINITY. What a wonderful success. The Mathematics Faculty is keen to build on the format of the evening for next year. Many thanks goes to all of the families, staff and community members that attended. The limited tickets for ‘Escape Room: The Game’ sold out early. Participants tested their team work and their wits against the Prison Break scenario. A group of teachers from Whitfords Catholic Primary School escaped to the safety of the Redmond Theatre Foyer in the fastest time to be named as champions for the night. 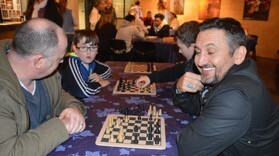 Many games of logic and strategy were played and the film was enjoyed by all. Special thanks to our local caterers Pudding Lane who joined us for the evening, Mr Chris Greenwood and Mr Ben Collins from the HUB for their assistance running the event and to all of the maths staff. 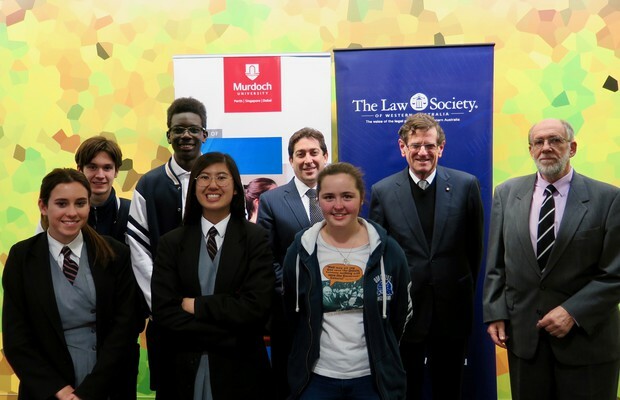 Earlier this week two of our Year 11 Politics and Law students were lucky enough to attend a lecture given by former Chief Justice of the High Court of Australia the Hon Robert French. He delivered a fascinating lecture entitled Judicial Review: Populism, the rule of law, natural justice and judicial independence. Hon Robert French was the first Western Australian appointed to the position of Chief Justice of the High Court. It was an honour for our students to meet such an influential leader. On Tuesday 22 August (Week 6) Dr Anne Aly, Federal Member of Parliament and counter-terrorism expert, will be speaking at Prendiville. All students, staff and family members are warmly invited to this exciting event. It is a wonderful chance for our students to meet a national leader. Dr Anne Aly is an internationally renowned expert in counter-terrorism and counter-radicalisation. Dr Aly was the only Australian to be invited to President Obama's White House conference on violent extremism in 2015 and has worked with the United Nations on developing programs and policies on national security and counter-terrorism. She is the first Muslim woman to be elected to Federal Parliament and is a funny and engaging public speaker. This is a free event however, you need to book a place to ensure you don't miss out on this exciting event! 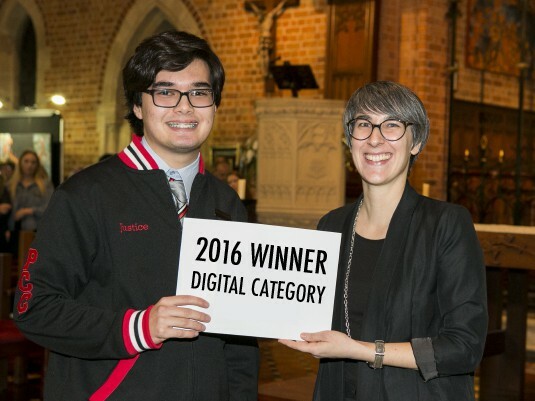 Year 12 Technology, Innovation, Design & Enterprise (TIDE) student, Brodie Andrews, received a Commendation for Outstanding Work. 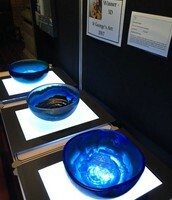 Brodie Andrews fused glass, recycled wood and metal sculpture ‘Island Dream’ was selected by a panel of internationally renowned practicing artists for the annual Meta 2017 art and design exhibition at North Metro TAFE. His work received a ‘Commendation for Outstanding Work’. Thirty-six schools had work selected, culminating in an exhibition of 64 pieces. The exhibition showcases innovative and exciting creative works completed by ATAR, General and VET Year 11 and 12 students enrolled in Visual Art and Design courses in Western Australia. Meta complements North Metro TAFE’s prestigious art and design programs and acknowledges the excellence and originality of budding artist/designers in senior secondary schools. Brodie is enrolled in the Certificate III in Design Fundamentals course, run in the TIDE Studios over a two-year period. The Meta 2017 art and design exhibition is open from, Wednesday 2 August through to Friday 28 August 2017. The Prendiville Dance students are back with a spectacular new show that’s better than ever! 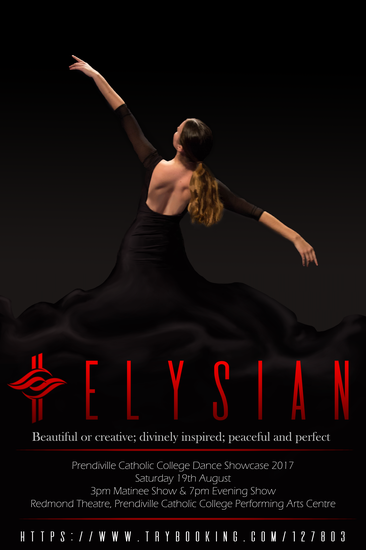 The showcase ‘ELYSIAN’ will be presented on Saturday 19 August with two performances, a matinee commencing at 3pm and an evening show at 7pm. The showcase will be presented by Years 8-12, exhibiting a number of exceptional acts and complex choreography that is sure to entertain all ages. Book your tickets NOW (Adults $15 and student/concession $10). Best wishes to the Prendiville Dance Company, Prendiville Tap Troupe and Prendiville Year 8/9 Dance Ensemble for their upcoming performances during Week 5 of Term 3 at the Perth Exhibition and Convention Centre, as part of their entry in the Senior Creative Dance section of this year’s Catholic Performing Arts Festival. The Dance Company have been rehearsing every Wednesday since the start of the year and have put together a routine with a fusion of contemporary and hip-hop styles choreographed by Mrs Johnson and guest choreographer Taihla Saunders. The Tap Troupe have been busy rehearsing at lunch times for the past two terms and their routine has been choreographed by Dance Prefect, Amelia Nutini (Year 12). 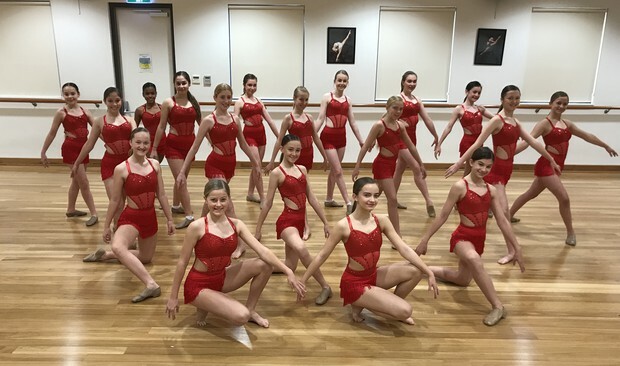 The Year 8/9 Dance Ensemble has been rehearsing every Tuesday morning before school for two terms and will be performing a Broadway jazz routine choreographed by Mrs Johnson. This event will be held on Wednesday 16 August at 7:00pm and tickets may be purchased at ticketek or by calling ticketek on 132 849 (Adults $25 and Students $20) from Monday 17 July. On Thursday 3 August all Year 8 Students took part in a Forensic Workshop run by a national company called Education Interactive. 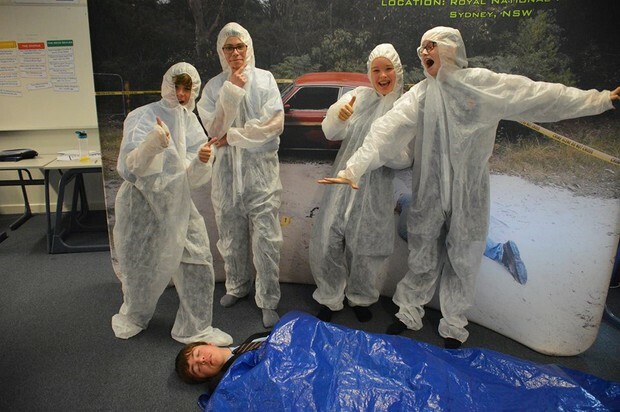 Students spent over 90 minutes involved in investigating a real-to-life crime scene and had to use all the clues and forensic evidence to work out who and how the crime was committed. While doing this they also were learning how chemistry, physics and biology can help to solve crimes. Students learnt such skills as the DNA profiling, fingerprinting and analysis of relevant data. 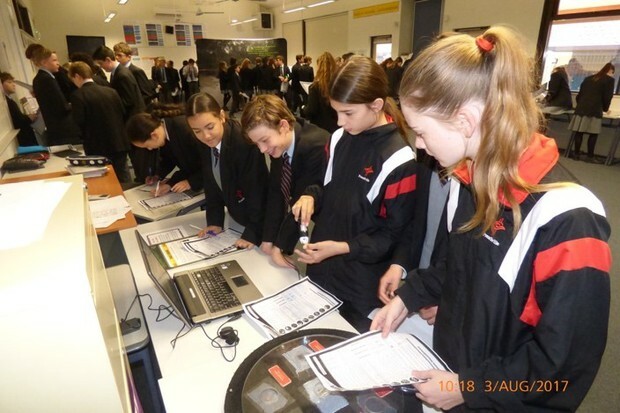 The incursion aimed to encourage a love of and curiosity in science among students and show them how science plays an important role in the world outside the classroom. 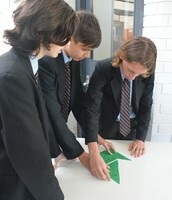 It was pleasing to see how the students participated and were involved throughout. A special thanks to the many staff for their support in running this activity and to Mrs Owen who helped in the organisation. Training is continuing on Tuesday andThursday afternoons from 3.30pm - 5pm for sport specific events. Wednesday afternoon sessions are taking place in the weights room and are open to all students who are looking to improve their strength, flexibility, power and speed that will improve their performance in their chosen events. Students are not required to register and can simply show up on any of the days. Athletic spikes are available to borrow for events that require them. A new round of emails have been sent to students and indeed parents inviting them to commence attending training arising from a number of errors that were discovered in the original results. There is still 2 more weeks until the Twilight meets and another month until the ACC carnival. All students who have been invited to attend training are legitimate contenders for the final team and are strongly encouraged to treat the opportunity accordingly. Training is not compulsory as a result of the busy schedules all our students keep from week to week and there is no expectation from myself or our athletics coaches that they must give up prior engagements or not fulfil their original commitments, whether school based or community based. I must stress that this does not eliminate any students from the possibility of selection in the final team. As mentioned the Twilight meets are taking place in week 6 and 7 (24 and 29 August). These provide the last opportunity for students to record results under competitive conditions that often play a large role in the final selections process. Again they are not compulsory and there is no expectation that students must attend, however if arrangements can be made with external parties to miss a one off commitment or even arrive a little bit later than usual so we are able to quickly gather results for specific events it will allow us to select the most accurate team and give students the best possible chance of being selected. 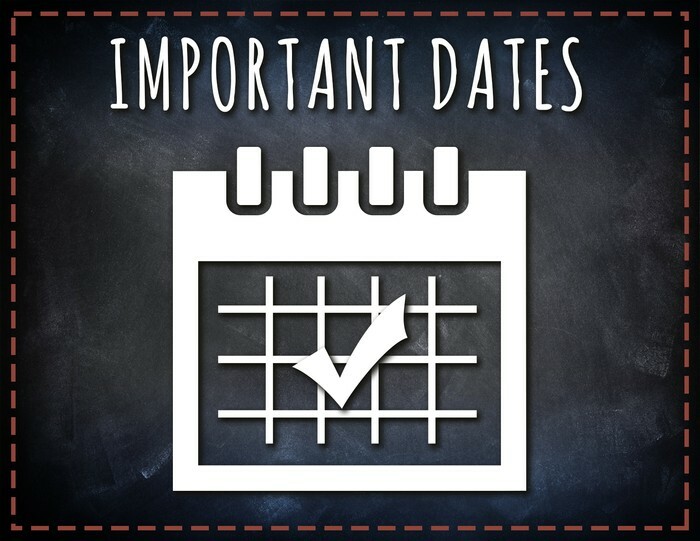 A timetable of events trainings are posted on the SPORTAL page on SEQTA as well as the list of events students have currently been identified for. If you have any queries about the athletics season please direct them to myself. The final ACC Carnival is taking place at the State Athletics Centre on 14 September. As per usual we have to supply a large number of officials (9) in a variety of roles. If you are available to assist as an official please contact me at your earliest convenience as I will be submitting names to the ACC in the coming week. Nino Karow (Year 8) has just returned from the Australian Karate Championships with both a Gold and Silver medal. Nino now sits one level below the highly coveted Black belt level that he unfortunately cannot receive until he turns 16. Fabiano De Abreu (Year 7) continues to achieve amazing things in his chosen sport of Soccer. He will compete at the Pacific School Games in Adelaide in December as part of the WA Boys U12 side. In staying with Soccer, Trent Ostler (Year 10) is heading back to Sydney to train with the National U16 Soccer side in preparation for the Asian Football Confederation Qualifiers in September. The Australians have been drawn in a group with Vietnam, Cambodia and hosts Mongolia. This term, the school participated in our 2017 Interhouse Athletics Carnival. 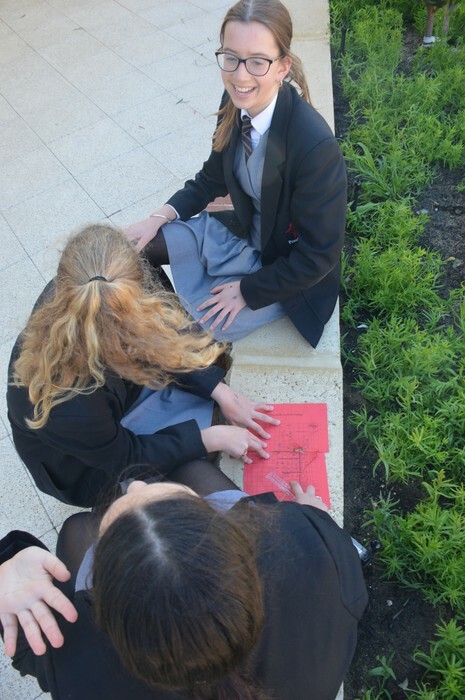 Students were given the opportunity to participate in an unlimited number of events, in a bid to maximise participation among all year groups. 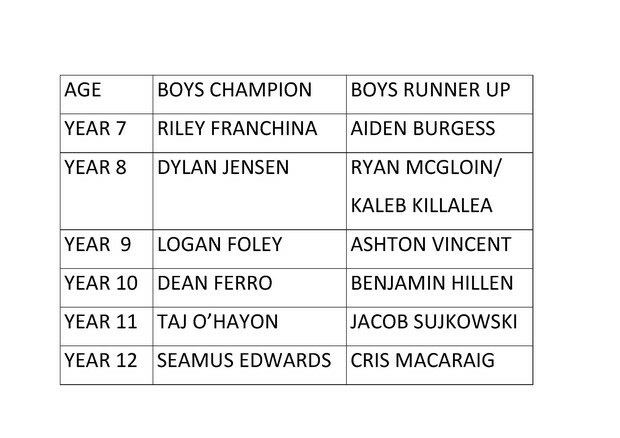 Students excelled on both days, demonstrating a high level of athletic prowess across the day of events. It was also very pleasing to see the Italian Exchange students as well as the Japanese students from Sagami Girls Junior High School mingling with the Prendivillians. The carnival concluded with the relay carnival and despite the weather, we had a big number of students come down and support the top four runners from each House and age group compete for the coveted Interhouse Athletics Trophy. With the closest results that have seen in quite awhile, SALVADO came out on top, winning Champion House again! In addition, congratulations to MCAULEY for winning the Golden Bear, demonstrating house spirit, sportsmanship and organisation over the two days. Lastly, a big thank you to the many staff, parents/guardians and Prendiville Alumni who assisted with various roles throughout the event – Denny Piovesan, Sam Lenaghan, Sandra Kent, Tristan De Villiers, Paolo Da Silva, Ruby Cunningham, Ellie Leeming, Courtney Poole, Ronald Rixer, Mikolaj Goscicki, Matteo Bresciani and Callum Haigh. It was proven once again that events such as The Interhouse Athletics Carnival would not happen or run the way it did without the support of the College community. Thanks to everyone involved! Joondalup Sisters are playing as part of a 6 team series on Friday 18 August at HBF Arena and are extending an open invitation to any girls who wish to come and watch some Contact Rugby 7’s live. 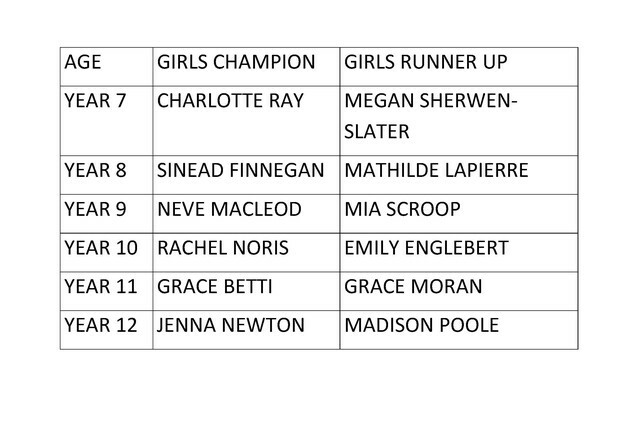 Furthermore, the competition director would love for any girls who may be interested to join in for training on Tuesday and Thursday nights from 5.30pm - 6.30pm also at HBF Arena. For more information please speak to Chad Capelli (0413 315 536) if any students are at all interested. Please note there is no supervision of students outside of these hours. Another chapter of Book Week is about to unfold and we have planned numerous activities to celebrate. The Book Week theme for 2017 is Escape to Everywhere. This year we shall not only continue our tradition of celebrating Book Week but we are planning to make this year the biggest one yet. I urge you to keep an eye on the daily notices so you don’t miss out on any of the activities planned. We will host award winning author Norman Jorgensen for a book signing and a chat in the Library during lunch. During period 5 he will speak to the Year 10 cohort sharing some of his experiences and tips on creative writing. We are lucky to have an author of this calibre join our Book Week celebrations. Bring along any copies of Norman Jorgensen’s books and have them signed by him. 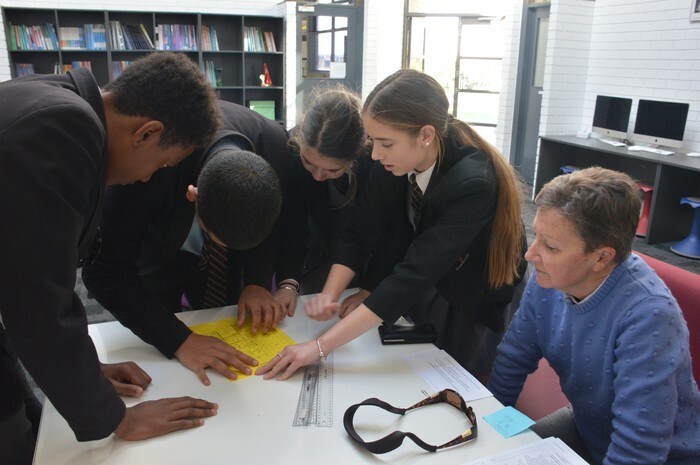 James Foley, a renowned author and picture book artist, will spend the day working with a group of Year 10 students to create a picture book over the course of the day. When you have a free moment, pop into the Library and watch the creative process in action. The Student Council in collaboration with the Library staff will run the Staff Vs Student Council book charades in the Redmond theatre during lunch. Come along and enjoy the spectacle. 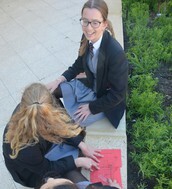 This year the Student Council are organising the inaugural Book Week dress up, raising funds for (Indigenous Literacy). You are encouraged to dress up in a costume related to the theme, Escape to Everywhere. Prizes will be awarded for the best dressed. The Escape to Everywhere mystery book lucky dip will run throughout the week. Students can select a mystery book and see where it will take them on their escape. It is shaping up to be a great week, make sure you check out some of the activities we have scheduled. 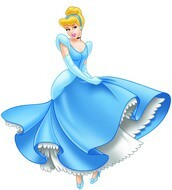 I look forward to seeing the creative costumes students and staff wear to the fund-raising dress up on the Friday. 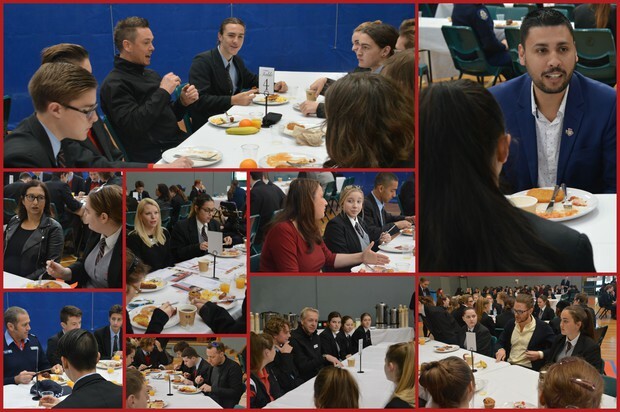 Thanks very much to the following very generous people who donated their time to attend our 2017 Year 11 Careers Breakfast and helped make it the success it was. Skills West Expo is Western Australia's leading, largest and most attended careers event that enables visitors to explore tertiary and VET course options, find traineeships, apprenticeships and plan new career pathways. Skills West Expo is free for all who attend and will be held on 18 – 20 August 2017 at the Perth Convention and Exhibition Centre. 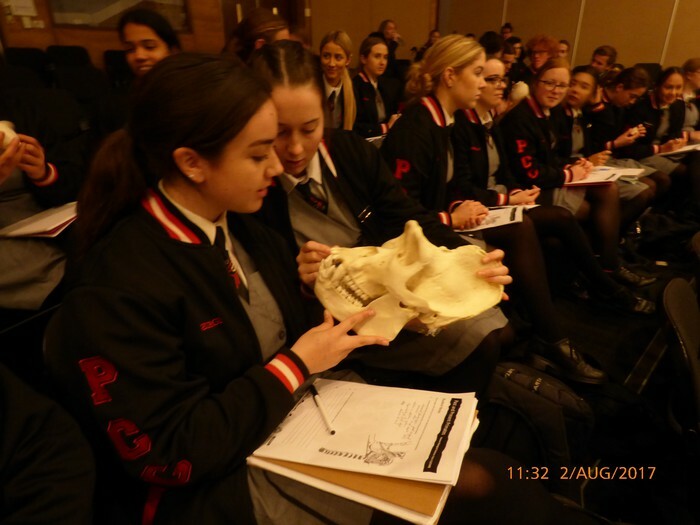 On Wednesday 2 August 2017 the entire Yr 12 Human Biology cohort embark on an adventure to the Perth Zoo to immerse ourselves in the theory of evolution and the fascinating trends in primates. 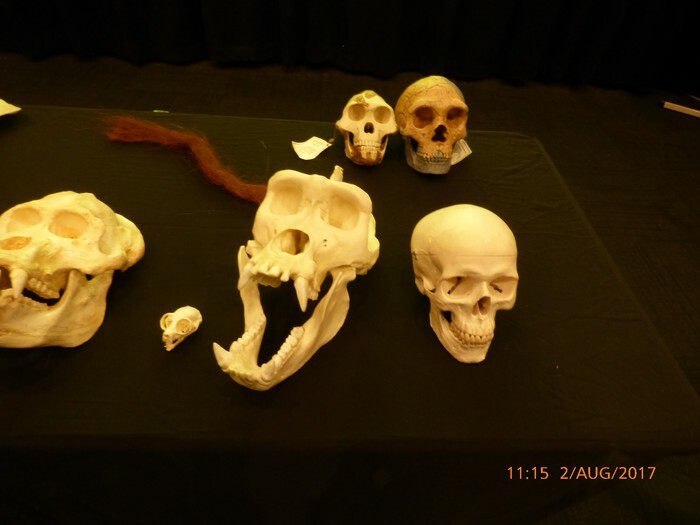 As part of our year 12 Curriculum, we investigate the origins of humans and how we evolved into what we are today. The eventful day began with a trek around the lake to visit the gibbons and lemurs to identify the features of these animals and their adaptations to their environment in contrast to our own. Our first trek ended with a trip down the African Savannah to explore the uniqueness of the baboons. As the day progressed on we were beyond fortunate to receive an in-depth lecture from a Zoologist who educated us on the evolutionary trends of primates along with techniques on how to categories primates. Being able the hold life sized skeletons of animals was by far the best part. After the lecture and a well-deserved lunch break, we all ventured out to the Primate Trail to explore the Orangutans, Tamarins and Marmosets. These fascinating creatures helped us solidify our knowledge on primate classification and environmental adaptations. 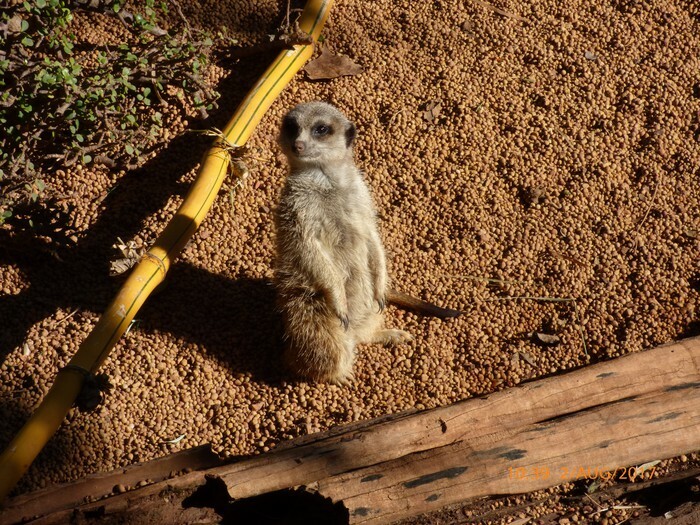 This educational day out to the Zoo was an incredible experience and allowed many students to put their prior theoretical knowledge to the test in a practical environment. Our incredible adventure to the Zoo could not have been possible without the wonderful work of Mrs Jovanoski and Mrs Tranquille so on behalf of the Year 12 Human Biology student I'd like to thank you for all your hard work. The Woolworths Earn and Learn Program is on from 26 July to 19 September. The Education Support Centre will be participating again this year. This is a great opportunity for our Centre to claim some great educational resources. 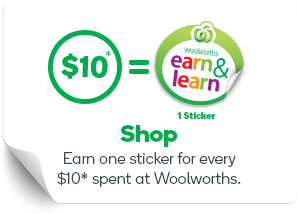 If you would like to support us, you can collect Earn and Learn stickers from any Woolworths store. Stickers can be deposited into our bins which will be located at Woolworths Currambine and also here at school in front of Student Admin. Stickers can also be dropped off to the Education Support Centre. Prendiville Catholic College's 2015 and 2017 musical productions of HAIRSPRAY and THOROUGHLY MODERN MILLIE respectively are available to purchase on DVD now! This sale is for a strictly limited time until Friday 18 August. No purchases can be made after this time. 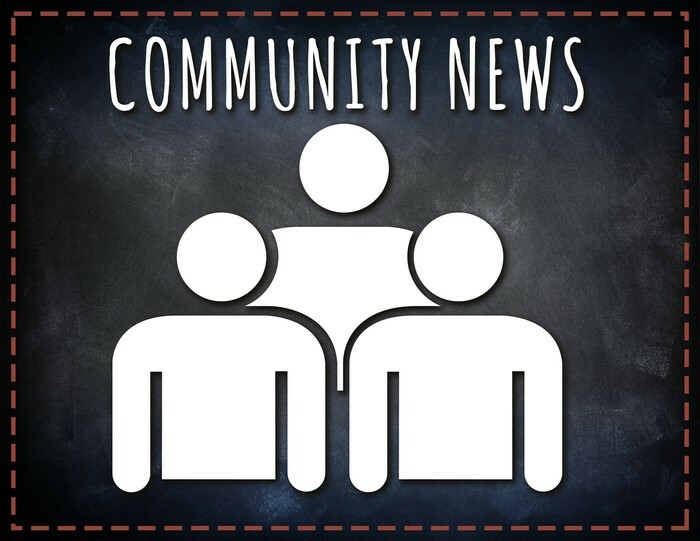 The Prendiville Swing into Spring community event that was planned for Friday 1 September has been postponed due to the recent weather and probable long range forecast. The P&F will be hosting this event in term 1 2018. More details regarding this will be available later in the year. An associate of Prendiville Catholic College, studying to become a social worker, has initiated a program called 'The Cinderella Project'. The project aims to help girls from other schools who are unable to go to their school balls for different reasons, mostly because they can’t afford to buy a dress, shoes, etc. Donations of dresses, shoes, handbags and dress jewellery to assist the project would be greatly appreciated and can be handed in to the Administration office. 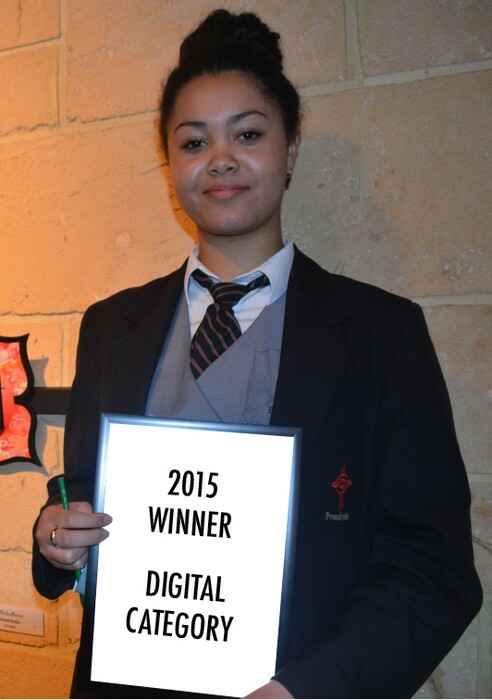 Ms Jade Charles has generously offered to co-ordinate the project at Prendiville. 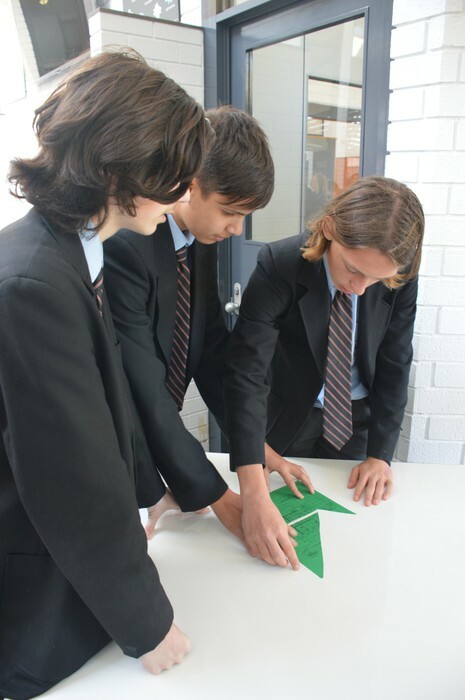 Our newsletter background photo was taken by Year 10 student Joshua Hardey. Joshua captured the fantastic shot at Burns Beach on Thursday. Well done Josh! All youth in Years 6-12 are invited! Are you searching for ways to enrich your understanding of the Catholic faith and tradition? Would you like to find out more about the role of women in the Bible, the leadership of Pope Francis or John Paul II’s teachings on the theology of the body? The Centre for Faith Enrichment offers a wide range of face-to-face and online courses and events on topics ranging from spirituality, Church history, theology, scripture, Christian living and much more. No exams or assignments, just a relaxed and friendly learning atmosphere. To know more visit our website where you will find our courses and events page. To stay up to date with Centre for Faith Enrichment courses and events click here. MercyCare is the leading not-for-profit Catholic provider of aged care, family, health, disability and community services. Our Community and Home services provide support to assist individuals over the age of 65yrs to remain as independent as possible in their own home. There have been many changes within aged care over the last few years, and many people do not realise that there are government funded services available to individuals to keep them living at home for longer. These services can be flexible and include support to participate in social activities or to keep up with the essentials, assistance with everyday household tasks and assistance in supporting everyday personal care activities. The services also include in-home nursing assistance with wound-care, continence management, and medication management. There are also many support services available for carers to enable them to take a break. Please call Samantha from MercyCare on 6228 1537 to discuss the support services that are available to help you. Alternatively please email. The Hub: A Home For Bright New Ideas! Follow our official Facebook for up to date pictures from everything happening at the College, from student and staff superstars to Prendivillians out and about in the community! Our Instagram is filled with regular photo and video updates from vibrant and exciting life at the College, and includes features from our other Instagram accounts!